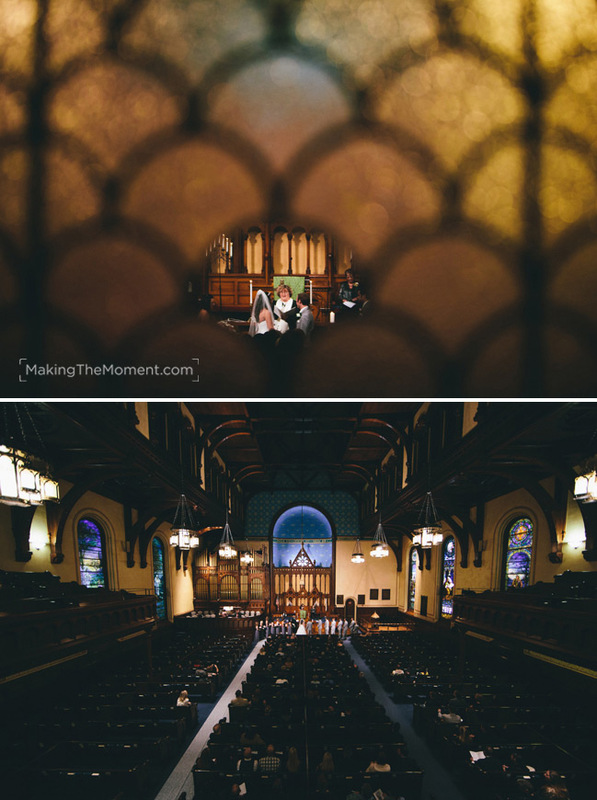 Weddings rock – they really do. Whether you’re at that stage of planning your wedding, or just dreaming of what they day will be like, it’s an exciting thing. What rocks even more? Good people like Jennifer & Matt. 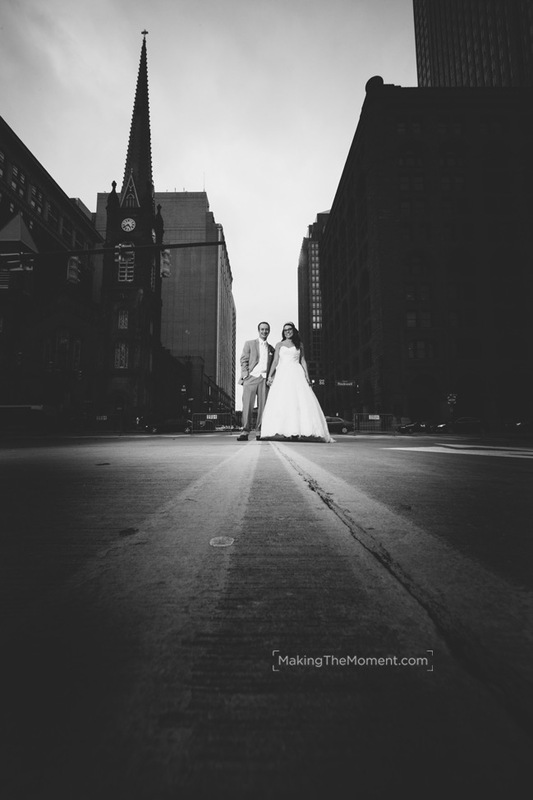 This is the story of their wedding in Cleveland; how and why it rocked. 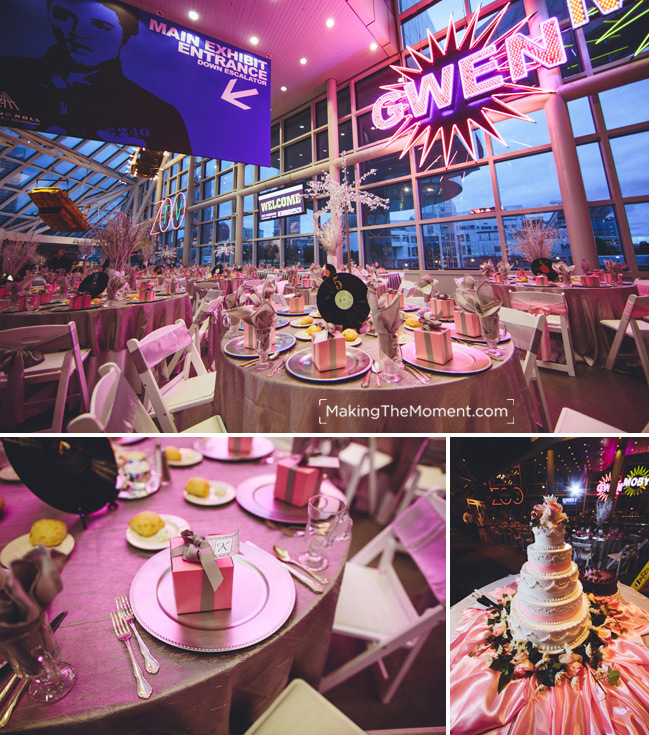 It wasn’t just the joy of having their wedding reception at the Rock and Roll hall of fame in Cleveland, it was really their heart and love for each other that binds them together. 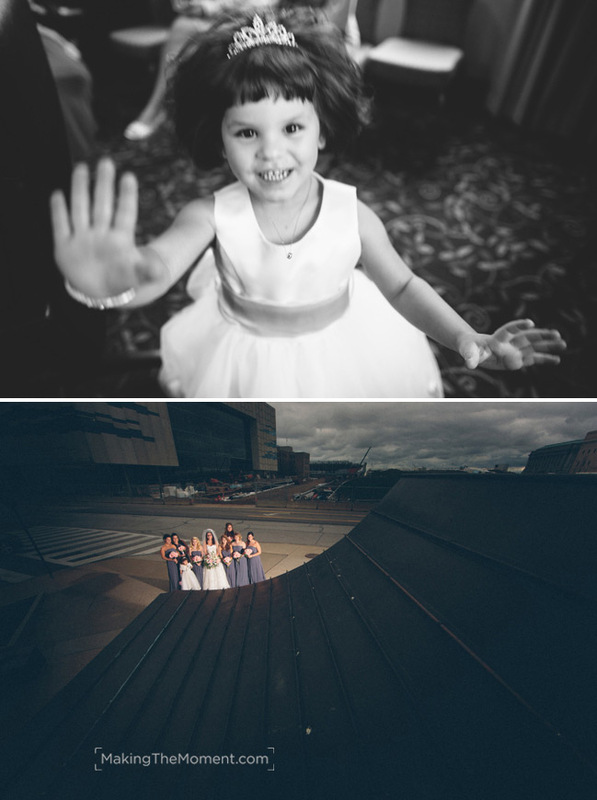 The image above is one of my favorites from their wedding reception at the Rock and Roll hall of fame in Cleveland. 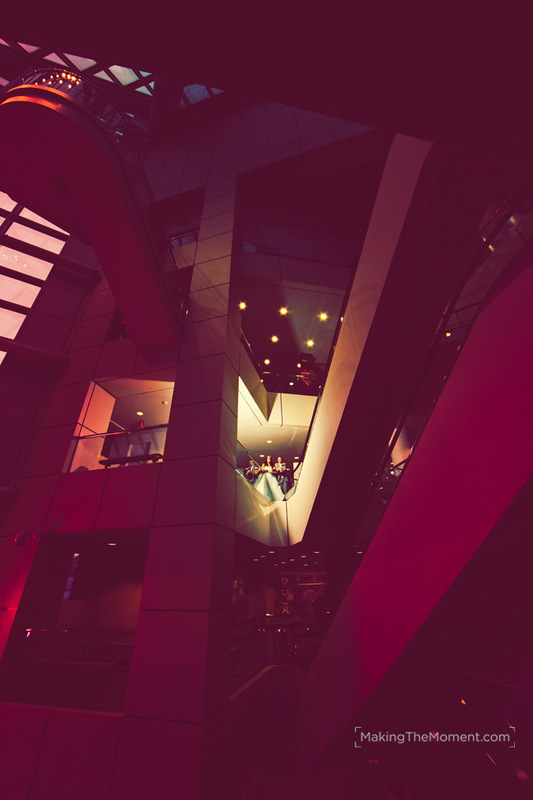 A wedding photographer at Rock Hall has it made – it’s loaded with tons of architecture and color, and filled with awesome little nooks and crannies to create in. Meet Jennifer – she’s just as lively and joyful in real life as the images above imply. This is why I love my job I can really capture the feel and heart of a person in an image. I think that the best wedding photographers in Cleveland are those that can capture the soul and essence of a person in a single frame. Meet the men. The guys love Matt, and for good reason. Matt is a good man, very caring and so easy to be around. A pillar of strength and a man who was able to singularly focus on Jennifer throughout their wedding day in Cleveland. All throughout the day he was thinking of her and excited about their coming marriage. 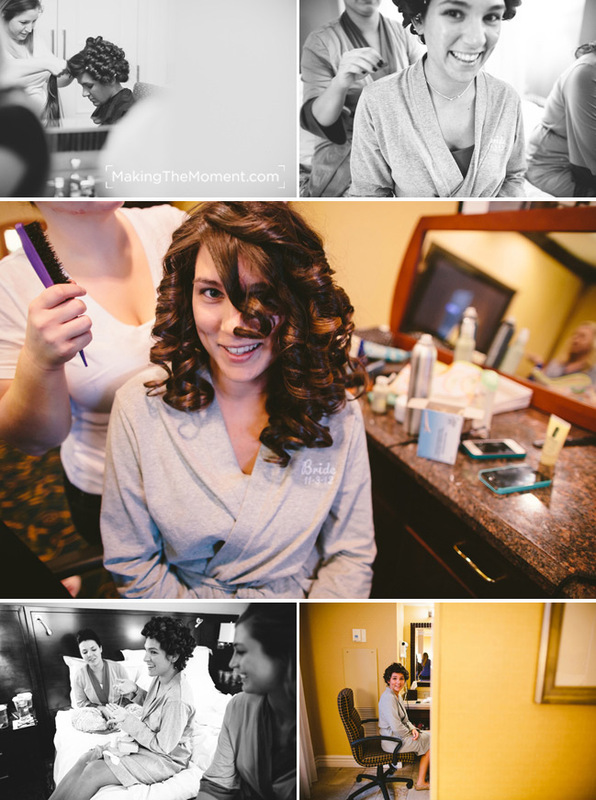 It’s a distinct honor to be one the many cleveland wedding photographers. I have such a fun and enjoyable profession – being able to capture and tell story from a couple’s most important of days. Something I really believe any good photographer will tell you is that we ♥ our job – we do it because we believe in the power of imagery and the essence of legacy preserved there-in. I have been a wedding photographer in this city for about 7 years now, and many times have captured imagery at the Old Stone Church. 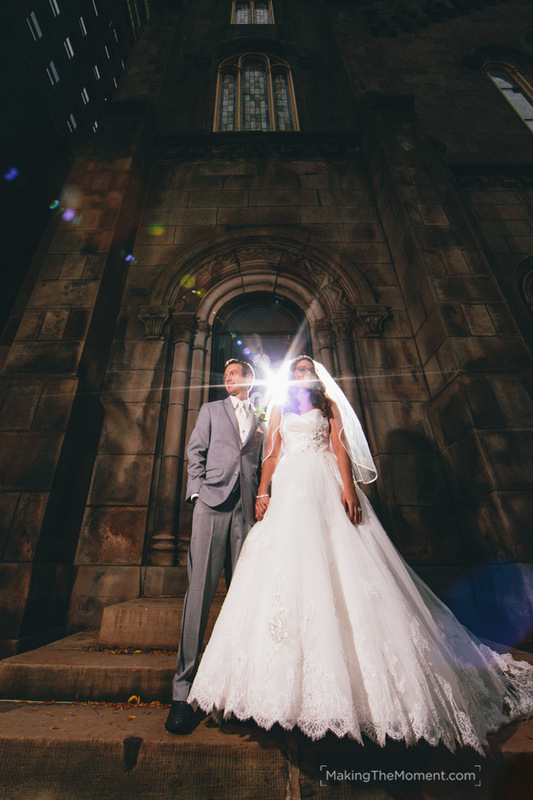 A wedding ceremony at the Old Stone Church in Cleveland is one full of heritage and history, as the building itself is a historical landmark. It’s a beautiful place for a wedding, but can be difficult to photograph. You really have to know your stuff and have the right equipment, and be incredibly respective of the venue’s rules. 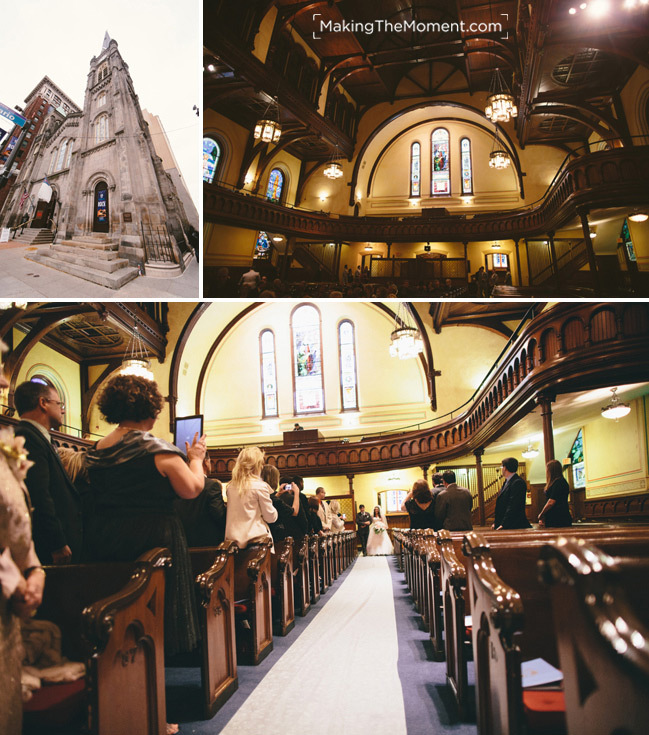 Whenever I photograph a wedding downtown, I love working with the old-school gothic style architecture – it brings so much gravity and presence to a wedding image, especially in contrast to the organic nature of a bride and groom. 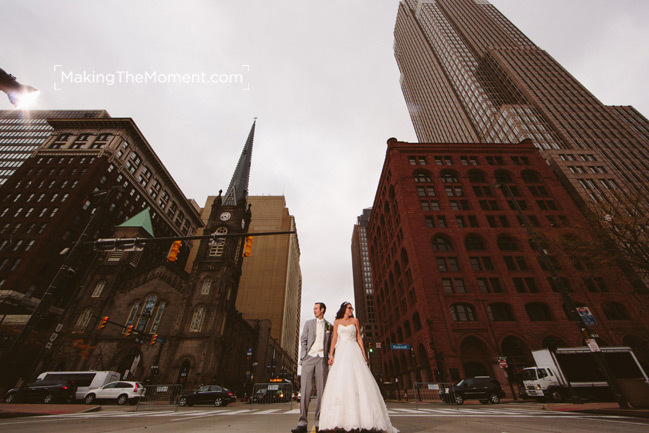 Couples like Matthew and Jennifer combined with the architecture of Cleveland make for a perfect recipe for some awesome imagery. Thankfully there was an ultra rare closing of the streets for a presidential motorcade, and this wedding photographer was able to get a rare perspective and image of a couple. When shooting downtown I’m rarely able to create directly on the streets – but I took advantage of this rare moment without traffic and was able to create some fun artwork. A wedding is not just about photography, but is really about the story of the families and the people that are being united. 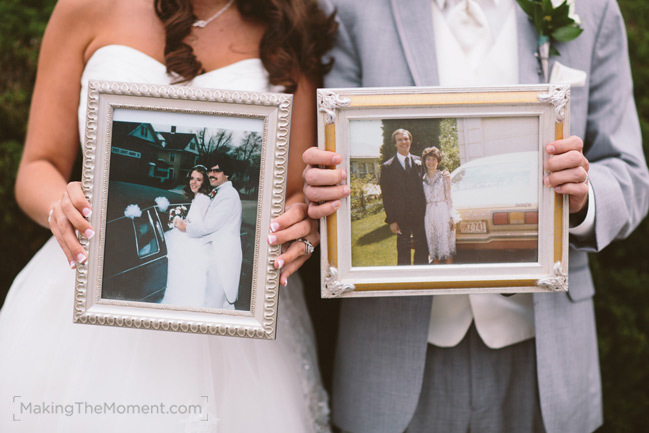 Seen above are Matthew and Jennifer sharing the past story of the love that went before them in a sweet tribute to their parents. 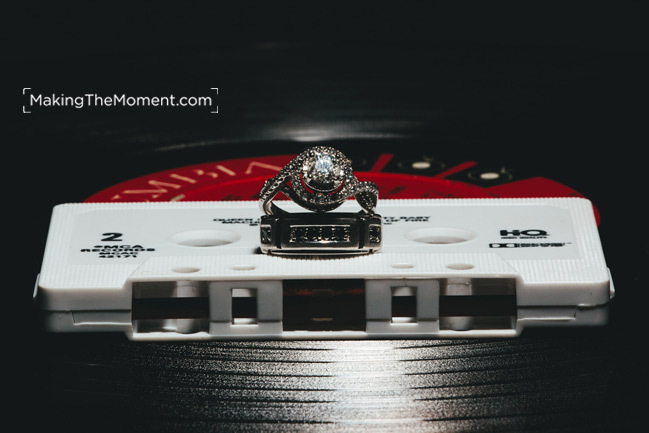 We have the distinct honor of being one of the recommended cleveland wedding photographers for the Rock and Roll Hall of fame. It’s a pretty nifty venue filled with story and history. 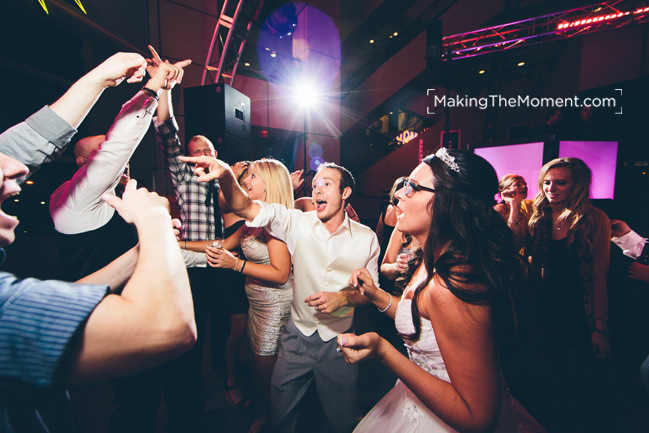 With a wedding reception at the Rock and Roll Hall of fame in Cleveland, you have perfect access to some really unique wedding photography opportunities. We ♥ the Rock Hall staff who allowed us wonderful access to the venue for making this artwork happen (thanks Anne!!)! Oh goodness. 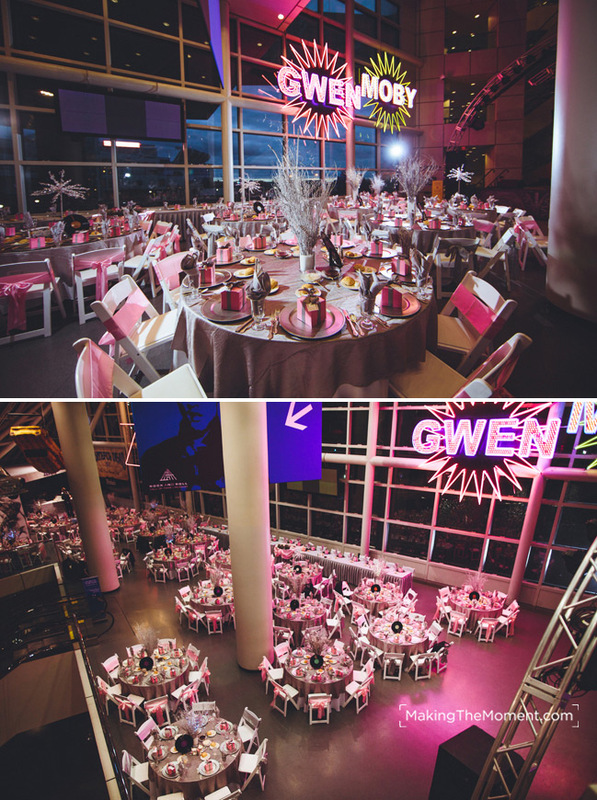 The set-up and attention to detail is pristine and nothing less than art thanks to the Rock Hall’s super talented staff, and the Executive Caterers at Landerhaven. Honestly, I think I spent a solid 20 minutes just photographing the little details, parts and pieces that made up for the atmosphere that evening. 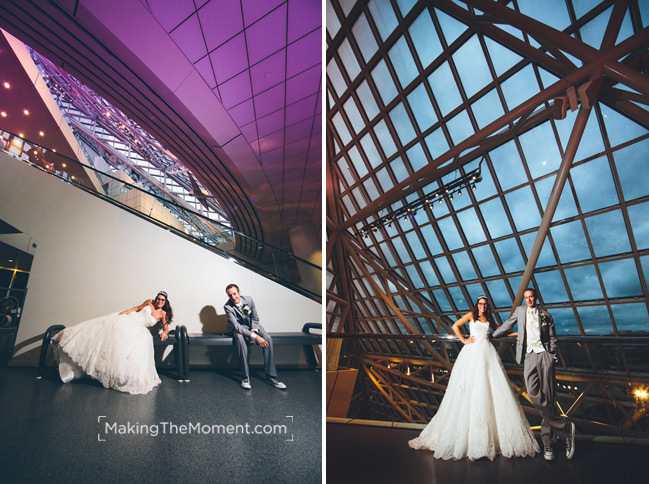 For real, the atmosphere and impact of a wedding reception at the Rock Hall can you leave you breathless at times. There is just so much depth and presence to this giant glass pyramid in Cleveland you can’t help but be excited when you’re in there. Prior to the reception actually starting, guests were invited to mingle at a high end cocktail hour in the upstairs spaces near the exhibits. That’s how you make an impact for your guests – not only do they get to drink and dine a bit, but they get a posh tour of a Cleveland Landmark. 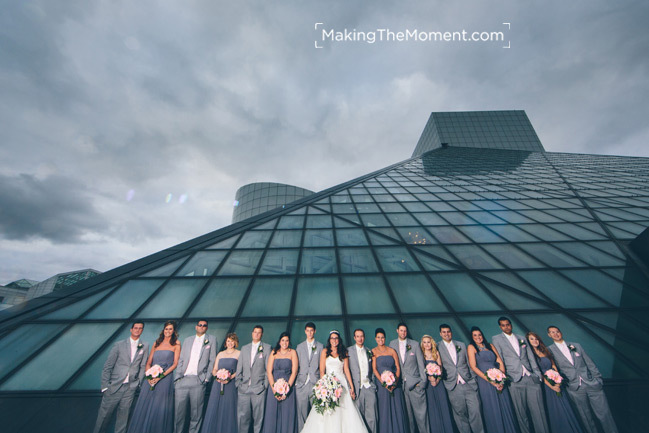 We have a short list of our very favorite Cleveland wedding reception venues, and the Rock Hall is definitely on that list. One reason this venue works so well for Matt and Jennifer is who they are. For them, the Rock Hall wasn’t simply just about style or class – but also about sharing with people the heart of who they are. With Matt being a music producer, the reception venue almost had to be a music related place! 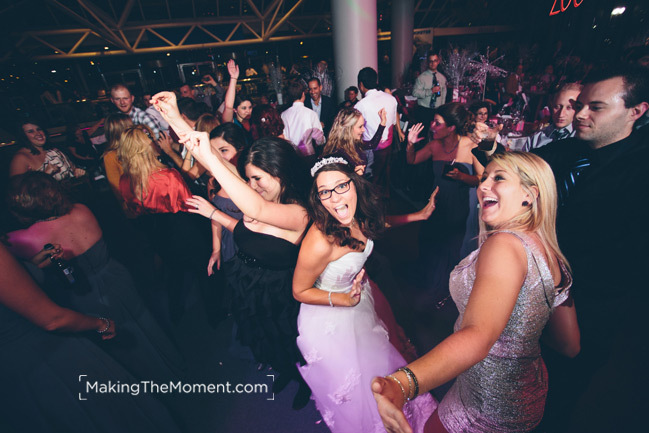 This wedding reception at the Rock Hall was hosted by none other than our good friends at Rock the House, some of our very favorite cleveland wedding DJ’s. I love this image of Matt during the wild party that ensued. 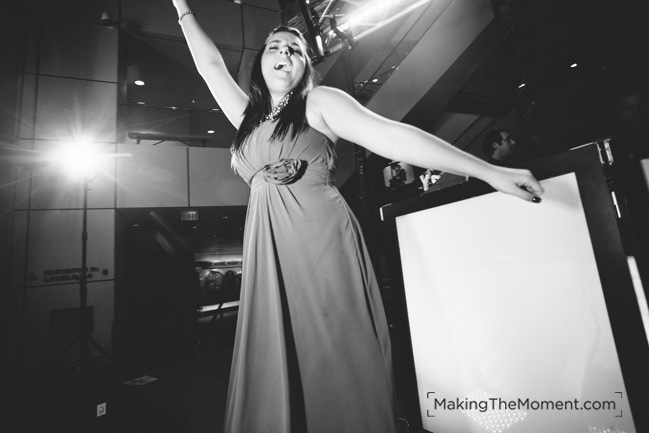 Not sure why – I just love his face – priceless 🙂 One of my very favorite moments of this wedding reception at the Rock Hall in Cleveland was when Jennifer’s sister jumped up on the stage and began singing and dancing. 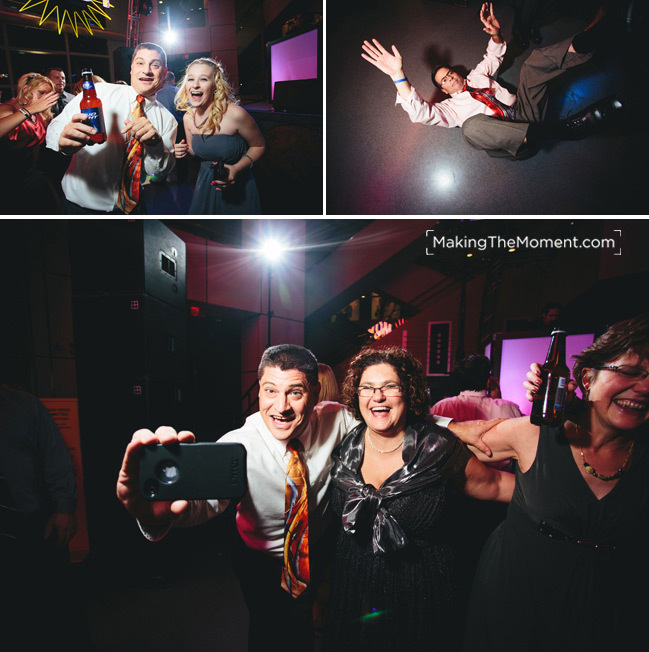 Impromptu awesomeness at your reception is an absolute must. There’s Jennifer and her friends partying it up. You know it’s a great night when the bride and groom are on the floor constantly. Little tip to my couples? 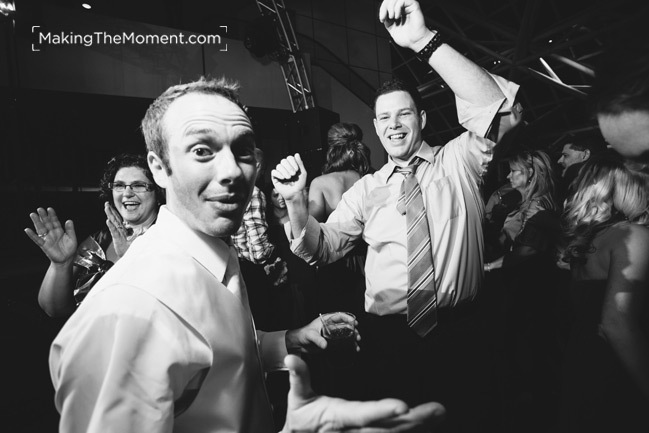 If you want your guests to be on the dance floor – you need to be on the dance floor!. Your guests simply want to be where you are. When you’re having fun, they’re having fun. 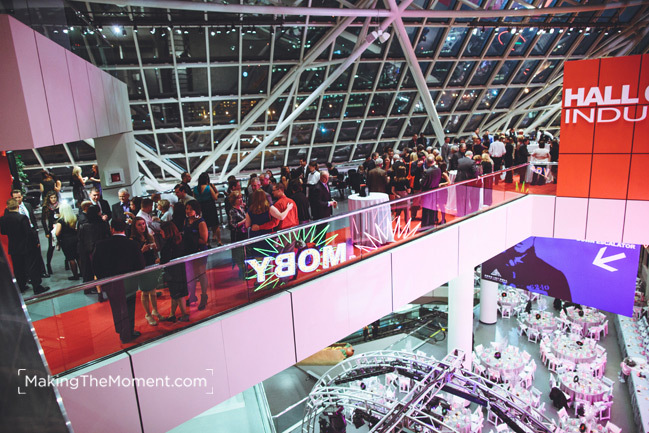 I think it’s the significance of the space that makes a wedding reception at the Rock and Roll Hall of Fame in Cleveland such a hit. You are surrounded by a legacy of rock that simply insists you join in on the party. I love how much fun Matt and Jennifer were that night. The two carry so much joy and energy that we partied through the night without missing a beat. At one point I remember being surrounded by a group of excited guests who dance circled around me cheering. Awesome. My heart and aim in being a cleveland wedding photographer is to capture and preserve in single images the story of a couple. My ring shot above is a tribute and homage to Matthew and Jennifer’s love for each other, and to their love for music. It’s somewhat fitting that if you have your wedding reception at the Rock and Roll Hall of Fame in Cleveland your wedding ring shot needs to be musically geared right? 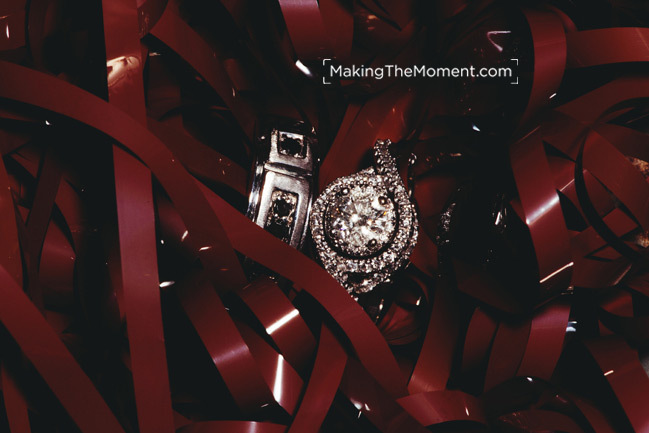 One of their wedding ring shots (above) is also a tribute to their mutual loves – I pulled the tape from a cassette tape to wrap the rings inside of (Michael Jackson’s “Thriller”, actually). Aaron, Lisa and lots of planes!